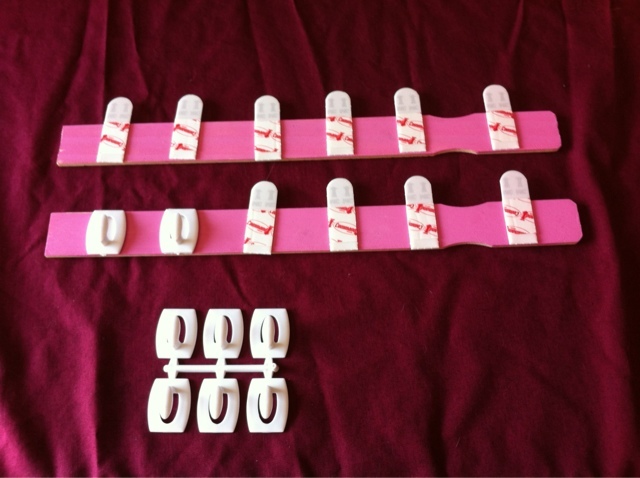 Frugal & Fabulous: 10 Minute Necklace Organizer! Love a craft that doesn't take all day and that doesn't cost a bundle? Check out my paint stick necklace organizers! All I did was take two paint sticks from Home Depot (free while making other purchases) , and two packs of 3M mini hooks. I bought the 3M hooks at CVS a few weeks ago when they had a Command strip deal going on. With the deal, I paid less than $1 for two packs of these mini hooks (6 come to a pack). All I did was paint the paint sticks with some paint I received during a Glidden promo a year or so ago (=free), cut the command strip adhesive to size and then stuck on the hooks! You could also use small nails or cup hooks (the hooks you'd use to hang mugs in your kitchen) but this is what I had on hand. There were a few tabs of extra 3M adhesive in the packages so I just stuck them on the back of the paint sticks to hang them inside my closet. Voila! 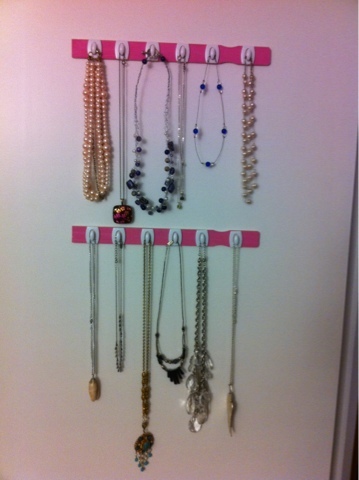 An inexpensive necklace organizer that is functional AND CUTE! What cool idea! Thanks for sharing.